NOTE: An abridged version of this review appears on Kasterborous here. The Daleks. Something almost as old as Doctor Who itself. 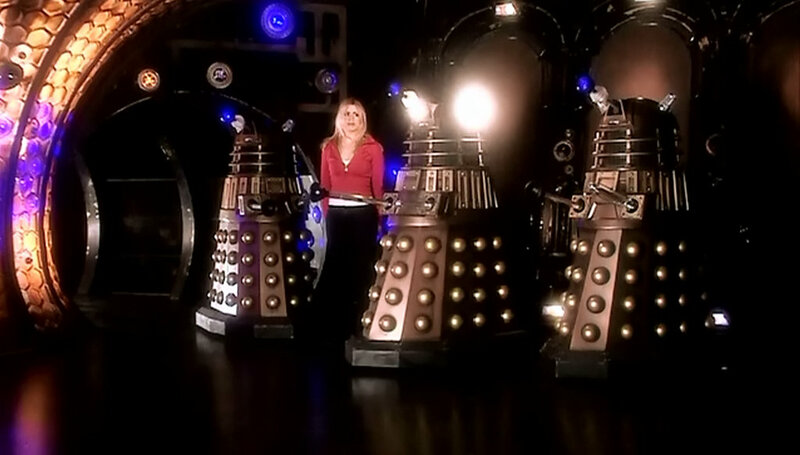 As Doctor Who is approaching it’s 50th anniversary, so are the Daleks themselves. They’ve appeared with every incarnation of the Doctor in all these years (although the McGann one is a bit spurious). They’ve been loved, mocked, made fun of, remounted, turned into color coded kids merchandise options, they have also been known to get you tea from time to time. 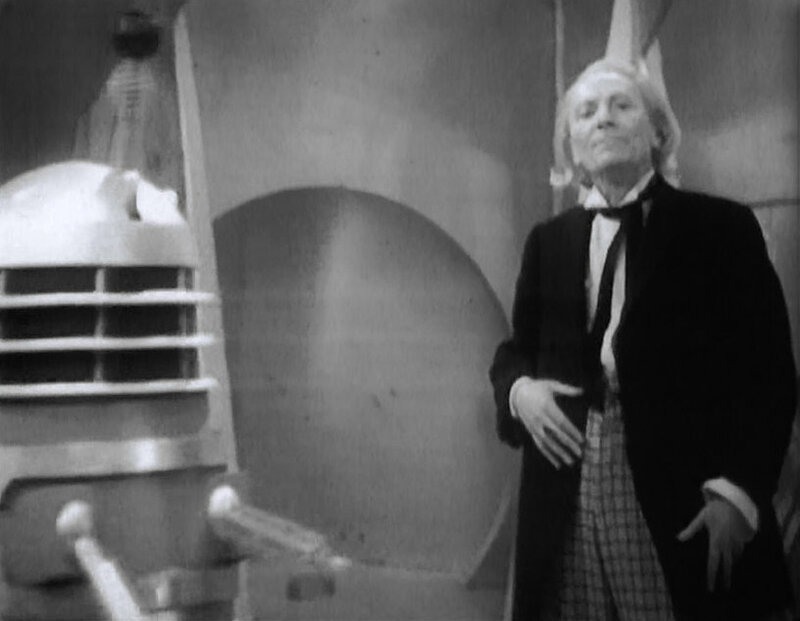 Legend has it that one of the original series “bullet points” from creator Sydney Newman was that he didn’t want any bug eyed monsters, and when he saw what Verity Lambert was doing with the Daleks, he objected, until he found out how popular they were. Despite still being a valid character into 2012, and they’ll be the lead enemy in Series 33 when it starts later this year, most of their original design spec continues to this day. Which is odd, as the character has evolved somewhat. You wouldn’t think the Daleks would evolve (Dalek Sek aside), but they have – especially after a recent viewing of this story. Now I know comparing a 50 year old programme against it’s modern counterparts isn’t exactly FAIR, but it’s impossible to go back and watch the beginning of the Daleks without comparing them to what comes today. However, it’s with all this in mind that I cast an eye back on the original Dalek serial from 1963, simply called “The Daleks”. The first thing you notice when watching the show is the PACE of the program. 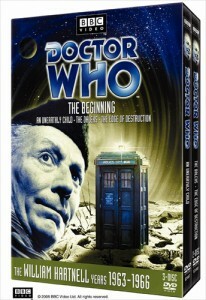 The complete story comprises 7 25 minute episodes, the equivalent of roughly 3.5 modern day stories. There’s entire sequences in this whole story that span an episode and a half that on the modern show would take up 10 minutes. Pacing and story telling is wildly different, and this also extends to the Daleks themselves. I would think if they made this serial today, they’d probably do it as a two parter. The story starts off slowly with the Tardis crew still inside the Tardis, where we get some more explanation of the Tardis itself. We see a food synthesizer, which dispenses food in the “futuristic idea” from the 60’s of food being in capsules and tasting like what we want it to. The Doctor explains food as being like component parts and colors, yyou mix them together to achieve the desired result – in this case J62L6 (Bacon & Eggs). Susan also says that the computer on the ship can direct them wherever they want if they’re fed the right kind of information, but does not elaborate on what it is. Some of this setup is forgiveable, as Unearthly Child spends about 80% of it’s time outside the Tardis, so some of what it is and can do needed to be dealt with. So once they’ve done some of this exposition, they wander out and view the suurounding area, which is the petrified forest (hence the name of the first episode, “The Dead Planet”). 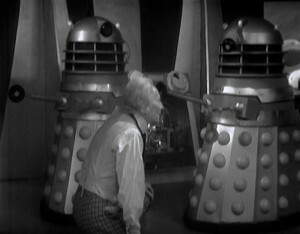 An early example of the Doctor’s attitude pops up quickly, where he lies to the crew to get a view of the Dalek city below that they spotted earlier. Hartnell’s Doctor early on was portrayed as a bit of a frump, and this was a good example. “Fine – you don’t want to go? Well, we’ll go anyway, I’ll just make you think it’s the only way to go”. He eventually confesses to the “crime” in a latter episode, and there wasn’t much repercussion to that, oddly enough. But the acharacter of the Doctor is in full display here, from the cranky old guy, to the caring soul that permeates all the incarnations, to the alien who wonders why people don’t want to do things his way. It’s actually well handled by Hartnell. The first episode closes on what was at the time an epic cliffhanger. Not so much now, because we all know what the Daleks look like, but back then, Episode 1 ended with Barbara being menaced by a Dalek, but all we could see on screen was the plunger. That probably works well if you’ve never seen a Dalek before, but in 2012, I find it unlikely someone has never seen a Dalek before, much less watched THIS episode first over any other. The resolution of the cliffhanger actually prolonged the drama a bit further, since you didn’t find out what was behind the plunger until about five minutes into the episode. I’m guessing part of what makes the original impact of Episode 2 was that we had never seen a Dalek before (at that time). As I started watching Doctor Who in 1983, I’m well versed in Daleks now, and the impact of that is lost on me. It doesn’t seem like such a dramatic entrance to me, but I’m looking at an almost 50 year old show with an enemy I had seen multiple times before I saw this episode. Still, it does show the Daleks as being calculating, as they stun Ian’s legs where he can’t walk – as opposed to just zapping him into non existance. 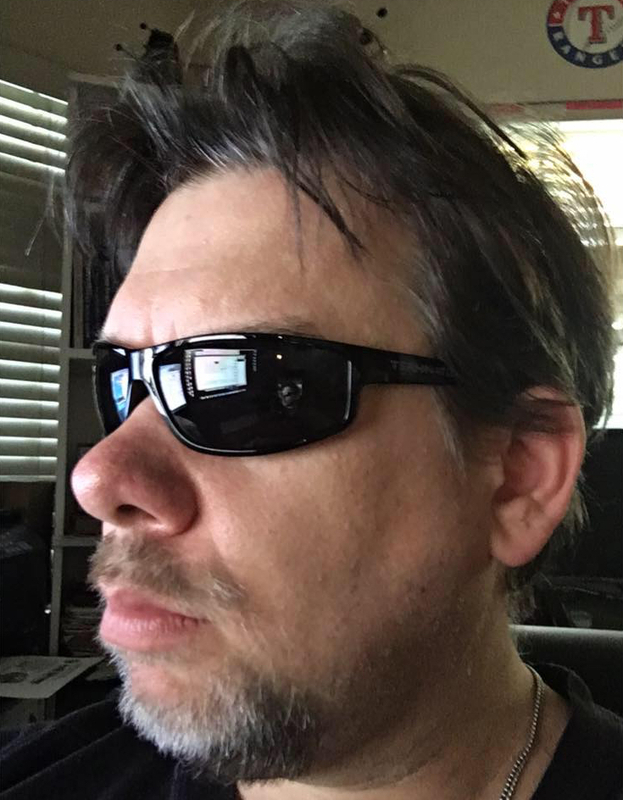 I guess in retrospect, that probably made it quite dramatically entertaining, as you don’t know what these things were, and what they were capable of. Their look certainly fit the monochrome aspect of the show at the time. Given the show was in black & white, I always felt their look was set well for that enviornment. The set design was quite good, so it all fit together nicely to the combined themes of nuclear devasation and the “metallic” feel of the Daleks. Always enjoyed that part of the story. Some of that set design has made it forward into the modern series, as well. 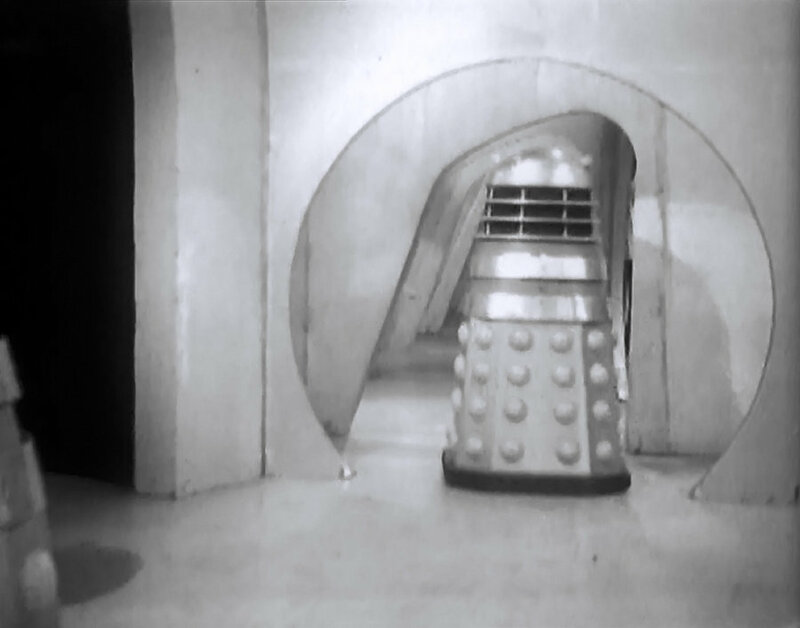 Some of the curved hallways have appeared in other Dalek serials – I really enjoyed seing the Dalek spaceships of Eccleston’s era have the same hallway shape taken from this 1963 serial. In another pacing issue, the majority of Episode 2 was taken up with deciding who was going to go back to the Tardis to try and get the anti-radiation drugs that the Thals left behind for them (although we didn’t know that at the time). Susan eventually goes and gets back to the Tardis, finds the box of drugs, and the cliffhanger isn’t as good as the first, it ends with Susan looking into the jungle as a storm rages. In fact, the bulk of Episode 2 (and a decent amount of 3 as well) take place in just a couple of places. The cell where the Tardis crew are, the Dalek control room, and the jungle area. We meet the Thals pretty quickly in Episode 3, and we find out they’re not the “mutants” that the Daleks made them sounds like they were. They were normal looking humanoids. The Tardis crew eventually recover and escape from the Daleks by hijacking a Dalek and “emptying it”. 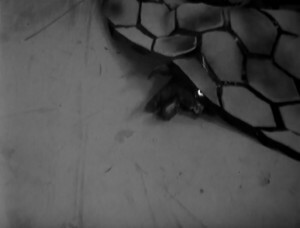 In this era of the show, the Daleks were powered by electricity on the floor, much like bumper cars (or dodge em cars). They stopped a Dalek cold by pushing it onto a cloak lying on the floor. Ian got into the Dalek, and lead them to safety, although not before a short adventure in an elevator shaft. It’s around this time we get a shot of the Dalek creature inside the shell. It wasn’t until the modern series that we got a good and CLEAR view of that. We did get the odd peek here and there in the classic series, but this shot also influenced future design. Episode 4 is the remainder of the Tardis crew escape, and they try and save the Thals from an ambush that the Daleks tricked Susan into. The Tardis crew extricate themselves from the Dalek city, and the crew meets up with the Thals again, and we get some exposition on the history of the Daleks and the Thals. In fact, the story could have quite easily ended here. The last parts of Episode 4 show the Tardis crew actually agreeing to leave (The Doctor even says that “we cannot jeopardize our lives and get involved in an affair that is none of our business”), but then we find out that the Daleks took the fluid link from Ian and it’s down in the city, so we have a second adventure to take to regain it, and that comprises Episodes 5-7. It’s almost, but not quite, like two stories meshed together, and the end of Episode 4 is the link between the two of them. However, Episodes 5-7 felt a lot like padding to me. First we got most of an episode with Ian trying to convince the Thals to help them. Then the actual trek to the Dalek City through an ungarded (by Daleks) area of a swamp took the majority of Episode 6 to reach there, and for some of the expedition not even until Episode 7. It was REALLY a slow paced part of the story, and not my favorite. The Daleks at this point were mostly focused on how to spread more radiation in order for them to survive. The two bits were totally separate, the Daleks didn’t interact with anyone else until most of the way through Episode 6. Funny moment in Episode 5, one that NEVER filled me with anything but laughter, but I expect it was never intended that way. It’s when the Daleks tried using the Thals medicine to heal themselves from radiation (it didn’t work). The resultant Dalek going “Help! Out of Control – AAAaaaaaaaa” (shown through the eyestalk) sounds like a bad drug trip and was seriously funny. This was the 60’s after all, so that perception might not be too far off, but it does speak to how different Daleks are portrayed at this point in the show’s history. The final episode starts with the Doctor & Susan captured. The other party eventually makes it in, and the Dalek plan to spread radiation is averted at the last second. The odd thing about the big finale, is the Daleks were overpowered and destroyed rather easily – Some of them immobilized by what appears to be nothing more than just a fist punch to the dome. The story ends with some nice dialogue between the characters, who seem to like each other. A nice short speech by Hartnell as well about the Doctor’s place and truth being in the stars was a highlight of the last scenes. This story has some better incidental music/sounds than a lot of shows of this era. 60’s British SCi-Fi has an odd quality to it, but this one feels more realistic than some of the others from the era. In particular the sounds from Episode 4 when the Thals get ambushed I enjoyed a lot. There’s also some decent split screen effects showing a Dalek trying to shoot Ian and missing. The extermination effect of this era was just inverting the video, but they split the inverted video on just half the screen, I thought it worked well for 1963 sfx. The overall “feel” of this story is smaller in scale. The Dalek plots are usually a large drawn out plan or something, but all they wanted to do here was escape their city. Got a kick out of the Daleks saying “What is this word – Su-SAN”? Susan laughed at that, and the Dalek instantly said “STOP THAT NOISE!” Made me chuckle. Probably my favorite “funny” moment. The first appearance of the Daleks ever. The only story where they needed power coming from the floor. They still needed external power, but how said power was delivered was changed in future stories. The story was known collectively at the time as “The Mutants”. However, when a story with that title was actually produced during Jon Pertwee’s era, this story needed a different name. For awhile it was called “The Dead Planet”, due to the pattern of naming a story after its’ first episode, but the more accurate “The Daleks” came into use around 1980 or so. 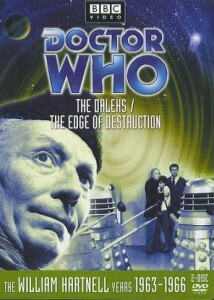 This was the basis of the first of the two Dalek movies of the 60’s with Peter Cushing as “Doctor Who”. That film came out in 1965, and was called “Dr. Who & The Daleks”. It largely followed the plot of this story, although it was much better paced, given it was a 90 minute movie. Episode 2 was recorded on November 22, 1963, the day John F. Kennedy was killed, and the day before the show actually premiered originally. 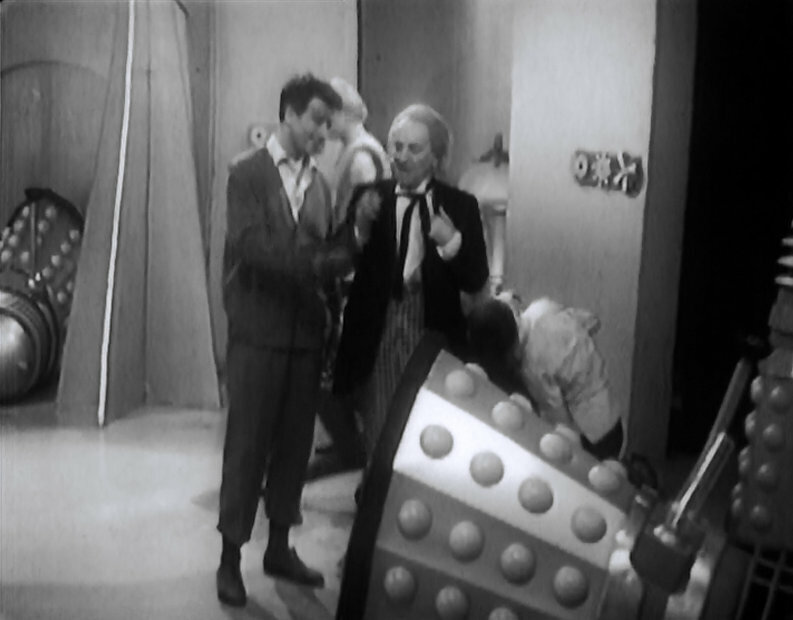 Episode 1 was filmed twice, much like Episode 1 of Unearthly Child. 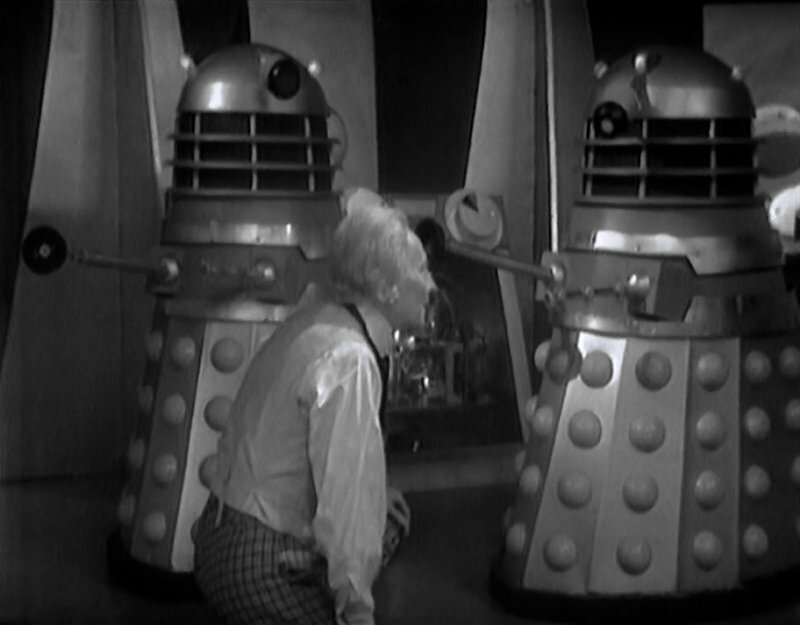 The original Episode 1 of The Daleks unlike it’s predecessor was pretty much the same story. Allegedly the recording picked up a bunch of external noise, and had to be reshot. The only existing footage from the original Episode 1 is in the recap at the beginning of Episode 2. This was the first story to ever be adapted for a novel. This story is a little hard to tie into the overall sequence of stories of the Daleks over time. At this time, the Daleks weren’t a legendary character, it was supposed to be a oneoff, so they “killed them off” at the end of the story. I always found it interesting that the Doctor’s first meeting with the Daleks was supposed to be the Daleks’ last appearance in their own overall timeline. An attempt was made some years later by Terry Nation to tie all the Dalek plotlines together into one cohesive story that made sense. This story originated that “buh-bum” background noise you always got in a Dalek ship – it has survived into the most recent Dalek stories, as well. It always felt “right” to hear that. Reminded me a lot of the general background noise on the bridge of the Enterprise in the old Star Trek series. The original designer of this story was Ridley Scott, who went on to much fame as a movie director. 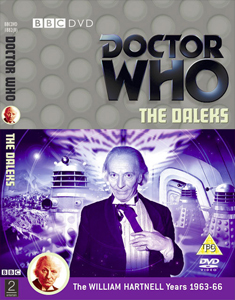 His original work for the Dalek design can be seen as an extra on the DVD for this story. His replacement was Ray Cusick. The fluid link which is a main story point in this story is also referenced again in the Hartnell story, “The Web Planet”, the Troughton stories, “The Wheel in Space” & “The Mind Robber”, as well as some non canonical novels. The events of this story are directly referenced in the Jon Pertwee story “Planet of the Daleks”. 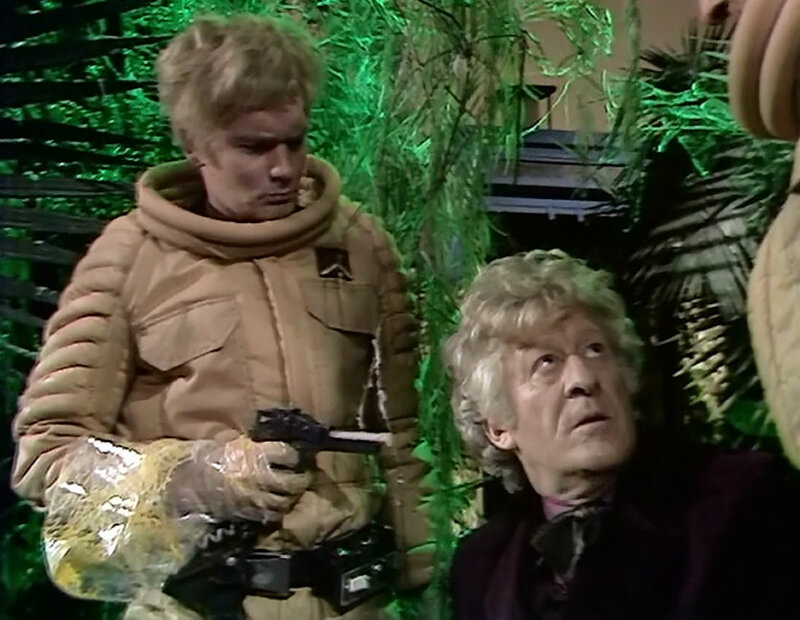 The Doctor meets the Thals on the planet Spiridon, and they initially refused to believe he was the same person. In the explanation to the Thals then, the Doctor also namechecks Ian, Susan, & Barbara. The hallway design from this story was lifted and used as part of the Dalek ship design in the Christopher Eccleston story, “Bad Wolf”. This story shows the Daleks to be a much more primitive character than the Daleks we know now. Daleks of this era are far more simplistic – even being apparently befuddled at one point by a small piece of metal that was keeping a door from closing. Even extermination is barely mentioned in this story. It’s not until Episode 4 that we get an extermination “order”, and one person actually killed by the Daleks. This is all due to pacing, and the storytelling of the era. It was 50 years ago. It’s hard to compare current Daleks to Daleks of this era, but it’s important to recognize where they came from. This story, while much different in it’s pacing sets the groundwork for many Dalek stories to come – including the Daleks of the modern era. So while the pace might be an issue for some people (the story could have moved much faster than 7 episodes), there is a lot worth seeing here, so give it a view if you’ve never done so. Overall, I give the story an 8 out of 10. It only loses the two points on pacing. I was so put off by the slow pacing of the story, that huge sections (including all of Episode 6) are skippable, so it came down for that reason alone.